Mix balance is something many people achieve gradually. Sometimes they stumble on it suddenly during an aimless process. Other times, they reach it at last, through sweaty, hard work. It shouldn’t be the case though. If you struggle to get a good mix balance, you’re doing something wrong. It also shouldn’t take much time and processing to get there. Why? Because it should be the first thing to go for. Surprised? What most beginners fail at is staying focused. But where should that focus be? The answer is very simple and obvious. To get a good sound. The goal of (most) music is to sound good. Duh. The problem is, many guys start to tinker with EQ. Or compression. Or all kinds of other effects. What makes it even worse is, they do it on individual tracks. There are at least a couple of mixing engineers though, who do otherwise. It might sound bold to you, but they do it the right way. So what’s the trick? Well, my friend, just push up those faders, and listen. And I mean, all of them. Are the guitars too loud? No problem, pull down their faders. The bass is too low? All you have to do is turn it up a little. Getting a mix balance is simple. 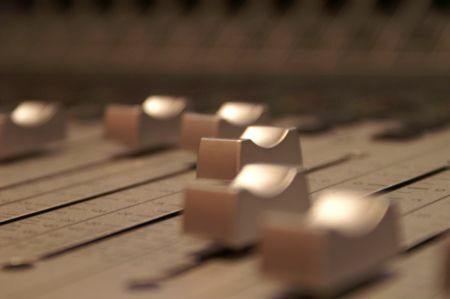 You just play around with the faders, until it sounds good. Let your intuition and musicality lead you. That’s where creativity gets some freedom. Trying to mix this way means you won’t get bogged down in the details. Not at first. Not right away. Still struggling with the mix balance? You shouldn’t be. Does it mean that once you got a reasonable mix balance, you can sit back and call the mix done? Of course not. I know that the temptation is strong, but it was really just the beginning. Once you have a balanced picture of the whole tune, you can start correcting the problems. What problems? The usual ones. Not steady enough levels – you go for compression. Frequency overlap – you reach for an EQ. Character enhancement – you use EQ again, and any effects you feel appropriate. Getting an interesting stereo image – you dive into panning. Getting a front to back depth – that’s when you take out your reverbs and echoes. It’s really the usual process, only it makes much more sense now. It’s also a lot easier to go through these steps this way. Why? Because you have started with getting a mix balance first.